Typhoon Mangkhut sliced across the northern tip of Luzon Island on Saturday. About 87,000 people had been evacuated from high-risk areas of the Philippines. Manila: After wreaking havoc and killing at least 25 people in Philippines, the deadly Typhoon Mangkhut, the strongest storm so far this year headed towards Hong Kong and southern China on Sunday. Typhoon Mangkhut sliced across the northern tip of Luzon Island on Saturday. More than 5 million people were in the typhoon’s path, which the Hawaii-based Joint Typhoon Warning Center downgraded from a super typhoon. Mangkhut was still punching powerful winds and gusts equivalent to a Category 5 Atlantic hurricane when it hit the Philippines. China and the Philippines agreed to postpone a visit by Chinese Foreign Minister Wang Yi that was to start Sunday due to the typhoon’s onslaught, which caused nearly 150 flights, a third of them international, to be canceled and halted sea travel. The Hong Kong Observatory said although Mangkhut had weakened slightly, its extensive, intense rainbands were bringing heavy downfall and frequent squalls. Storm surge of about 3 ½ meters (9.8 feet) or above is expected at the city’s waterfront Victoria Harbour, the observatory said, appealing on the public to avoid the shoreline. Francis Tolentino, an adviser to Philippine President Rodrigo Duterte, said the 12 died mostly in landslides and houses that got pummeled by the storm’s fierce winds and rain. 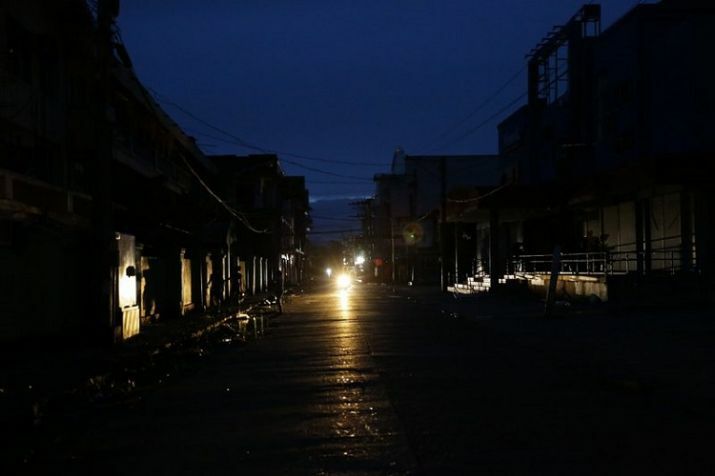 Among the fatalities were an infant and a 2-year-old child who died with their parents after the couple refused to immediately evacuate from their high-risk community in a mountain town in Nueva Vizcaya province, Tolentino said. Tolentino, who was assigned by Duterte to help coordinate disaster response, said at least two other people were missing. He said the death toll could climb to at least 16 once other casualty reports were verified. President Rodrigo Duterte is expected to visit the affected areas on Sunday and inspect the damage. Mayor Mauricio Domogan said at least three people died and six others were missing in his mountain city of Baguio after strong winds and rain destroyed several houses and set off landslides, which also blocked roads to the popular vacation destination. It was not immediately clear whether the deaths and missing cited by Domogan had been included in Tolentino’s count. Authorities were verifying the drownings of three people, including two children. About 70 men reportedly returned to their coastal village in Cagayan to check on their homes as the storm drew closer Friday, but Tolentino said he had received no reports of the men figuring in an accident. About 87,000 people had been evacuated from high-risk areas of the Philippines. Tolentino and other officials advised them not to return home until the lingering danger had passed.